It has been a long time since I have come across a story that has stolen my heart like Relativity has. 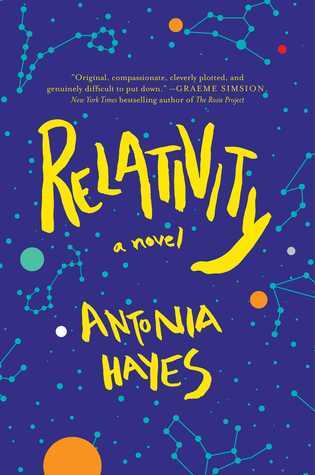 In it's 368 pages Relativity manages to capture the story of a beautiful relationship between a boy and his mother, a story between a woman and her whirlwind romance with a studying physicist and a story about a man and the painful past that tore him away from his family. Told in multiple perspectives, the book unfolds from the lips of 12 year old Ethan, his mother Claire, and his Father, Mark. Ethan is a remarkable character. One that will stay with you long after you've placed the book back on your shelf. Yes, Ethan is a genius and he can chat about Physics and Astronomy until your eyes begin to glaze over, but those details don't even begin to scrape the surface on what makes up this beautiful young boy. Ethan is magical; although he probably doesn't even believe in magic because it isn't based on scientific fact, he is truly a one of a kind character. He will make you laugh, cry and shake your head with wonder and amusement. Claire is complex. She has been hurt and glued back together more times than she can count. She has danced, piroutetted, loved and lost until her cracks begin to show. She was a woman who had her life mapped out perfectly, only to learn that life had a different plan for her. The relationship between Ethan and Clair is one that I can barely put into words. They are on their own galaxy. It was truly a beautiful and heart-warming relationship to watch unfold. Mark is broken. Another character that thought they had life figured out until one painful night tore everything he every knew out of his hands. Brought up by a loving mother and disapproving father, Mark was tainted. Until he met Claire. Then unfolds a blossoming, passionate love affair. One that radiates off the pages. Both strong and stubborn characters, their fierce love and fierce values radiate off the pages. All of these characters have more connecting them then DNA, they are all whisked away in the whirlwind of a painful past. The story unfurls over the course of a few days, while Mark is back in Sydney to give a final goodbye to his dying Father. It is his Father's last wish to Mark that sets the story of on it's bumpy trail. A character driven novel that will keep you engrossed until the very last page. An eloquently written raw and touching story about a startling secret, family, individuality and growth. This sounds like a good book. And that's a good review. This is no doubt the biggest over-blog.com/ selling factor of this running stroller and also it operates Title just as marketed for owners. This system obtains exceptionally BEST JOGGING STROLLER: THE EXPERT BUYERS GUIDE high marks for this attribute.